After a previous bid lost momentum in 2017, discussions of a St. Louis MLS expansion effort appear to be back on the table. At one point in early 2017, St. Louis appeared to be a strong contender for an MLS expansion slot. Backed by a group that included Dave Peacock, Jim Kavanaugh, and Paul Edgerley, the previous bid was headlined by a new soccer-specific stadium proposal for a site west of Union Station (rendering shown above). The funding model for the project called for a $60 million public contribution that was to be decided on by voters. In an April 2017 referendum, voters rejected the proposal, leaving some doubt about where St. Louis’ MLS hopes would stand going forward. An official in Gov. Mike Parson’s office told the Post-Dispatch that officials with the state Department of Economic Development met with Major League Soccer representatives as recently as Tuesday, and that the Parson administration was interested in working on a stadium proposal. The Parson official did not immediately know which St. Louis sites were under consideration nor how many times state officials had met with MLS representatives. The official had no information on construction plans, timelines or who else might be involved with discussions…. St. Louis Mayor Lyda Krewson confirmed there was still local interest in the MLS. 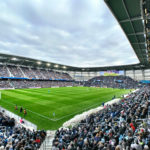 There had been signs that St. Louis could still be in the picture–the city was mentioned by MLS commissioner Don Garber in a recent interview with The Tennessean–but questions remain about both the city’s hopes and future MLS expansion. There are still plenty of uncertainties surrounding upcoming MLS expansion, as the league has yet to come forward with many firm details surrounding the next phase. Additionally, any St. Louis bid would have to resolve funding issues that stalled the last effort and decide on other stadium project specifics. (An option held by a city economic development arm to purchase the site near Union Station is close to expiring.) It is uncertain at this point which individuals would back a new St. Louis MLS expansion bid. Nashville was chosen in the last round of expansion by MLS in December, followed by the league’s selection of Cincinnati in May. New soccer-specific stadiums were at the center of both bids, so it stands reason that a St. Louis group will try to follow that model if its revives the city’s MLS expansion hopes.